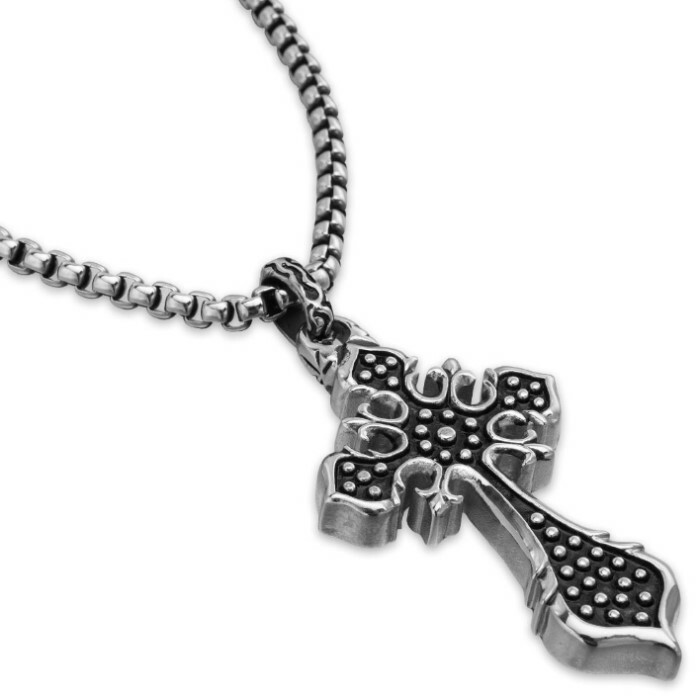 Studded Cross Pendant on Chain - Stainless Steel Necklace | BUDK.com - Knives & Swords At The Lowest Prices! 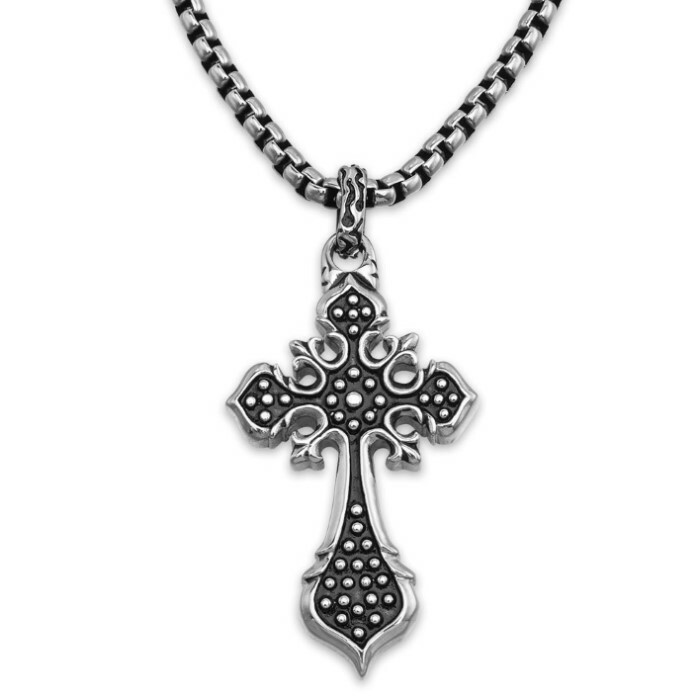 The alluringly chic Studded Cross necklace features superb craftsmanship and an elegant design that looks great on anyone, enhancing any wardrobe or personal style. 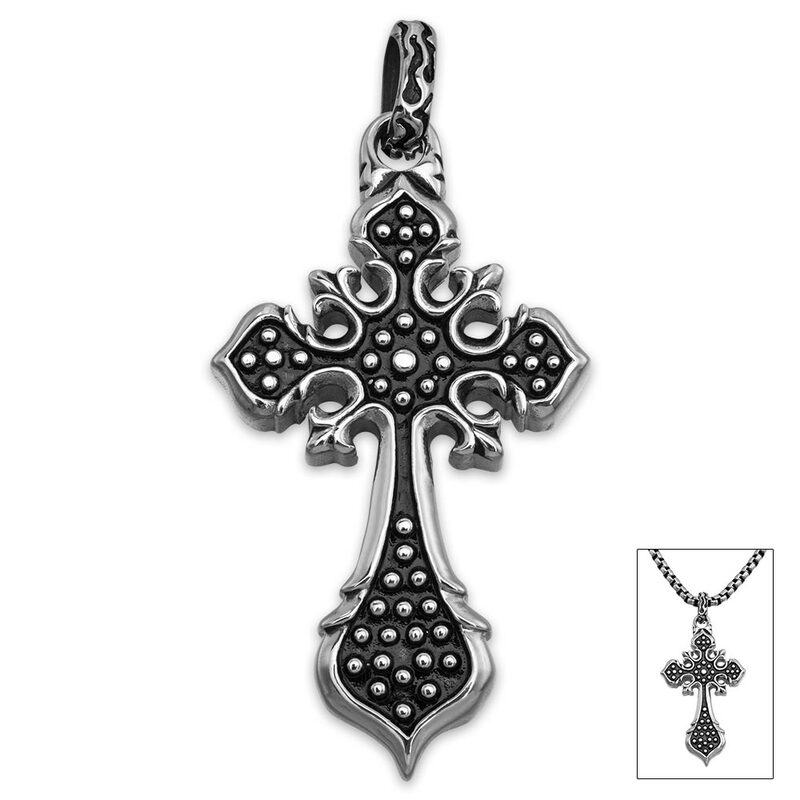 Suspended from a classic stainless steel chain, the cross pendant is a unique play on the classic St. Thomas cross, enhanced with raised studs and stylized form. Carefully crafted from only the finest stainless steel, this distinctive piece is truly forged for a lifetime of vigorous wear. Silver tarnishes, gold warps and fades, and even advanced ceramics are prone to chipping. With this rugged necklace, however, you needn’t fear damage while repairing a car, performing yard work or other hands-on tasks. Furthermore, high quality stainless steel boasts a sheen and ease of upkeep that simply can't be matched by more traditional materials - precious metals, composites and more. Necklaces don't get any more versatile, durable and stylish than this! It's a superb choice - for a ride on a motorcycle, a night on the town or simply as an everyday fashion accessory. It also makes a fantastic gift, and you won’t find a better price on high quality jewelry like this anywhere else. One size fits most adults.